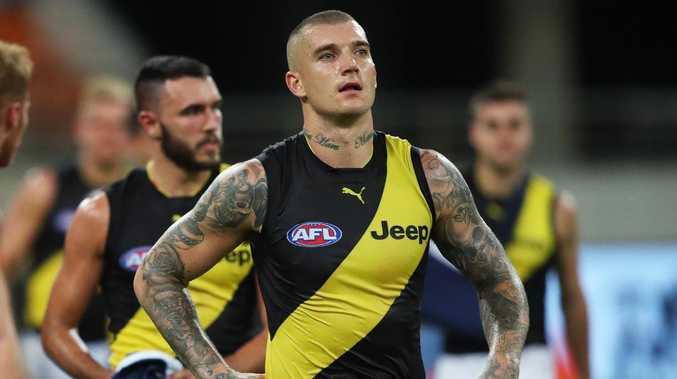 RICHMOND superstar Dustin Martin has taken to social media to apologise for his on-field behaviour against the Giants, which has also cost him a $7500 fine - of which most is suspended. Martin will miss Saturday's clash against Port Adelaide but is free to face Sydney the following week after successfully having his two-game ban for striking Giants opponent Adam Kennedy downgraded to one at the AFL tribunal on Tuesday night. But Martin has come under further scrutiny for his abusive gestures and a verbal sledge directed at opponents during the loss to the Giants. After asking for a 'please explain', the AFL on Wednesday handed Martin a $7500 fine, with $5000 suspended until the end of 2020. Should he reoffend, Martin will have to pay the balance. Earlier in the day, Martin took to Twitter for the first time since August 2018, apologising for his behaviour. "Frustrating one on the weekend! I understand my reaction is not a good look for the game … I apologise for my actions. Thanks," Martin wrote, adding a Shaka sign emoji at the end. It's unclear whether Martin's tweet is part of a recommended course of action from the AFL following the gestures. The outburst from the normally unflappable Martin came during a game in which he was checked closely by relentless GWS tagger Matt de Boer, having also been targeted by Collingwood's Levi Greenwood the week before. While Richmond has complained of a perceived lack of protection for Martin, the club is well aware its star midfielder also has a responsibility to manage his emotions. 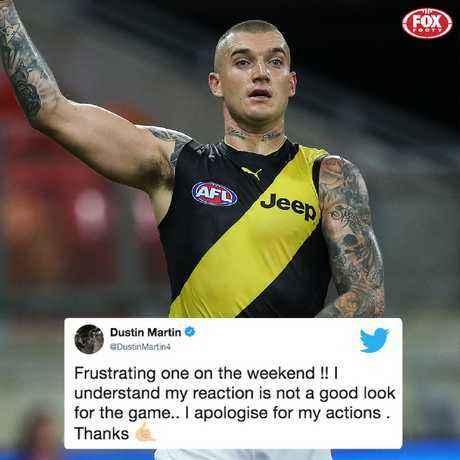 Dustin Martin has apologised on Twitter. "He's just got to take a breath," Tigers football boss Neil Balme said after Martin's tribunal hearing on Tuesday night. "He's a very, very good player. He gets the treatment because that's what he is. He's just got to get past it and we've got to help him a bit with it. 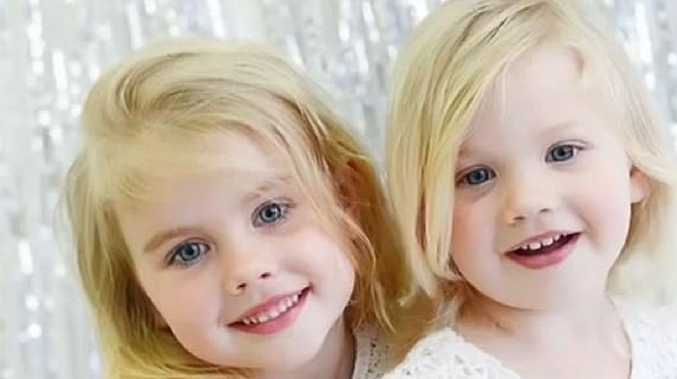 "It'd be nice if he did get a couple of extra frees but we'll see what happens there. He's got a week off which is disappointing for us but in two weeks' time, he'll be back at it and we'll see if we can get him a bit of confidence."